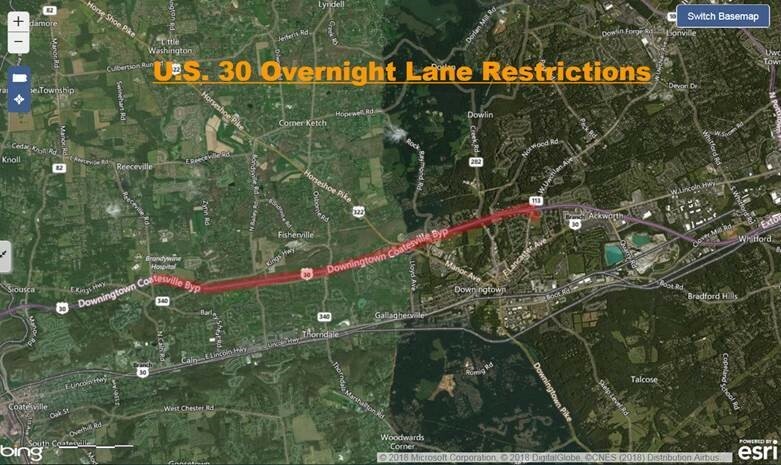 King of Prussia, PA – Overnight lane restrictions are scheduled in both directions on U.S. 30 between Reeceville Road and Route 113 (Uwchlan Avenue) in Caln, and East Caln townships, and Downingtown Borough, Chester County, on Sunday, October 28, and Monday, October 29, from 7:00 PM to 6:00 AM, for paving operations as part of an improvement project to repair and resurface 26 miles of state highway in Chester County, the Pennsylvania Department of Transportation (PennDOT) announced today. Motorists are advised to allow extra time when traveling through the work zone because slowdowns may occur. The contractor’s schedule is dependent on the weather. Route 340 (West Kings Highway) between Route 10 (Compass Road) and Business U.S. 30, in West Caln, West Brandywine, Caln and Valley townships. Main Street/Green Street/Swan Road/Upper Valley Road from Route 372 (Main Street) to the Atglen Borough line. Allan A. Myers, LP, of Worcester, Montgomery County, is the general contractor on the $6,262,777 project, which is financed with 100 percent state funds from Act 89, Pennsylvania’s Transportation Plan. Work on the entire project is expected to be completed in fall 2018. Follow PennDOT on Twitter at www.twitter.com/PennDOTNews and like the department on Facebook at www.facebook.com/PennsylvaniaDepartmentofTransportation and Instagram at www.instagram.com/pennsylvaniadot.